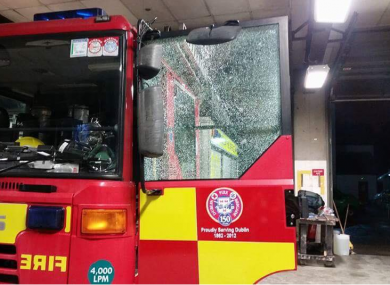 A FIRE ENGINE was pelted with stones last night as it responded to a call-out in a west Dublin housing estate. One unit of the Dublin Fire Brigade (DFB) was put out of commission after attending a small fire in the Neilstown area of Clondalkin. The fire engine was out of action for three hours after a passenger-side window was broken by stones. A DFB spokeswoman said there were no injuries but urged members of the public to respect emergency services. She said: “One of our appliances was dispatched to an estate in the Neilstown area after a fire started on a grassy area. “A number of people began throwing rocks at the engine causing damage to it. “The passenger-side window was badly damaged by the stones. Email “Firefighters attacked as they attempted to put out a fire in west Dublin”. Feedback on “Firefighters attacked as they attempted to put out a fire in west Dublin”.